It wasn’t until last year that I started incorporating milk kefir into my family’s diet. It took me so long because I was already settled into my yogurt making routine and honestly, I had tried kefir years ago and I remember thinking it was much too tart for my taste buds. Oh goodness, what years of adding fermented foods to your diet will do. From sourdough, kombucha, natural pickles, beets, and kraut, I now can’t get enough of anything fermented with a bit of fizz – tart and tangy. So last year when my friend Elisa gave me some kefir grains, I couldn’t wait to start brewing this nourishing probiotic rich drink at home. Kefir is a fermented milk product that originated in Southern Russia. Kefir (pronounced keh-FEHR) is much more than just bacteria but is also made up of yeast. Just like a kombucha scoby, kefir grains are also a symbiotic colony of bacteria and yeast. The benefits of the yeast and extra bacteria make it a much more powerful probiotic than yogurt as it may colonize the gut more thoroughly. Don’t get me wrong, I still love my sweet delicate yogurt, but in my family we are now consuming much more kefir than yogurt. Besides the probiotic benefits of yeast and bacteria to the gut, kefir is loaded with vitamins, minerals, and essential amino acids. It contains high levels of thiamin, B12, calcium, folate, and Vitamin K2. It contains minerals like calcium, magnesium, and phosphorous. It also contains biotin, a B vitamin that helps assimilate other B vitamins. For women deficient in B vitamins and magnesium, kefir is a great fermented drink to add to your diet that can help ease stress and anxiety. One of the things that I love most about kefir is how easy it is to make. All you need to do is place the grains into the quart sized jar and fill it with milk. Cap it with a lid, give it a shake, and place it on your counter at room temperature. Traditional kefir was made in skin bags that were hung near a doorway; the bag would be knocked by anyone passing through the doorway to help keep the milk and kefir grains well mixed. Since most people no longer ferment their kefir in skin bags, just give you kefir jar a couple of good shakes throughout the day to mix the grains into the milk. That’s really it. After 12-24 hours your kefir will be done. The jar above was fermented for about 6 hours. Since I use a cup of grains, it doesn’t take long to ferment at all! Just know, the longer your fermented time, the more sour and tangy it will be. Once it’s fermented, all you need to do is strain out the kefir grains from the thickened milk and whey. When straining, use a a non-corrosive straining utensil which can be stainless steel or food grade plastic. I use a spoon to mix the kefir and grains which helps the straining process. Once the kefir is strained, you’ll be left with just the grains. You’ll soon start to notice that your grains have multiplied. I like to use just about a cup for brewing. Anything more I feed to my chickens or give away to friends. However, a couple tablespoons of grains is all you need and won’t lead to such a tart and tangy brew. After straining, I pour my kefir into a pint sized mason jar and fill a quart sized jar with the grains to start the process all over again. Just remember, you don’t need to use 1 cup of kefir grains to brew. A couple tablespoons will suffice. The more grains… the tangier! How to make milk kefir - a probiotic yogurt-type drink. It's simple and completely nourishing! In a quart sized mason jar, add the grains and cover with milk leaving about 1-2 inches of headspace. Give it a good shake and set on a darkened corner of your countertop at room temperature for 12-24 hours. Make sure to keep it away from other fermented foods to avoid cross culturing. During the 12-24 hours, give it a shake to mix the grains and milk. 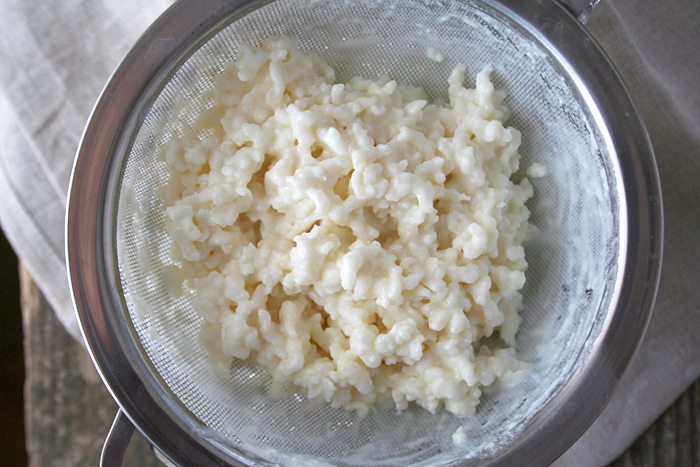 Once fermented, strain the grains from the kefir. When straining, use a a non-corrosive straining utensil which can be stainless steel or food grade plastic. Place the kefir into a pint sized or quart sized jar and store in the refrigerator. Place the grains into a clean quart sized jar and start the process all over again. One of the best things I love about kefir is how refreshed and energized I feel after drinking it. When I’m feeling sluggish, a bit sick, or need a bit of a boost, I drink about 6-8 oz straight. I love it. I now enjoy the tart and tang; however, my kids aren’t fond of it like that just yet. So for them, I make sure to include it into a morning powerhouse kefir smoothie 3-4 times per week. They drink this down and I’m sure you will too! So, do you enjoy drinking kefir? Tell me, what do you like best about it? Do you have any recipes using it that you can share with My Humble Kitchen? Thank you. I have been wanting to try making kefir for a long time. I regularly purchase it at Trader Joe’s and Wal-mart carries it now. Do you have a recommended source for purchasing the grains? I just bought 2 tablespoons from a lady on amazon and a week later I have several cups of grains. It really is easy. all I did was add the 3 tablespoons of grains to a quart of organic milk and then added that quart to a gallon jar of milk 3 days later. Now, 4 days (7 days total) later I have something akin to yogurt, which is exactly what i wanted, a yogurt like mix for smoothie making, that I can put in the fridge in a 1/2 gallon pickle jar. . When you added your quart of kefir to the gallon jar of milk, you left it on your counter? Did you leave the kefir grains in the gallon jar? I am very new at kefir. In fact, this morning is my first day of being able to drink the kefir after “reviving” the grains someone gave me. My kefir is more yeasty than sour, like yogurt. I would prefer a more sour/tangy taste like yogurt. I am so happy you are getting word out about the benefits of kefir. I have been making it with the same grains for eight years. The only difference is that I don’t use a cup of grains per quart. I only make a pint a day and I use 1 Tablespoon of grains. It works great with the small amount of grains. When the grains multiply to more than I need, I just blend some of them into the smoothie. What a great idea to blend the grains into a smoothie. I HATE throwing out grains. And don’t have enough friends who wanna make it. How much milk and what types of milk can be used? I typically make a quart of a kefir at a time; however, you can make larger batches. I use whole milk. I can’t wait to make this! Our commissary just started selling frozen keifer and I’m seriously addicted! I LOVE it! Quick question, can you make this with breast milk? I’m following the super nutrition for baby book, and I believe I saw keifer in their to feed your baby so I was just wondering about using breast milk :). Thanks! I’m curious about the amount of grains you use. I’ve been making kefir for a few years now and only use a couple of tablespoons for a quart of milk and it turns out great. Is using more better? I also find that if I stir the kefir while it’s fermenting it gets too curdley and weird, so I let it sit untouched then stir well before straining and I get really nice thick kefir. Can’t drink it straight though! Would you feel comfortable using free range eggs from Trader Joe’s for this recipe? Gosh.. I know for myself, I would. However, for my kids, I feel more comfortable giving them raw eggs from my backyard or locally produced from a local farmer. Question–I would like to flavor my homemade Kefir, but can’t find directions for doing that. Do you have directions or suggestions for how to flavor it, with fruit? I can’t make a smoothie as we don’t have a blender at this time! Thanks!! You can use fruit juices since you don’t have the ability to blend at this time. Use your taste buds as a guide to what ratio you like, when I have used this method in the past (not for lack of a blender but for lack of wanting to wash it!) I did 1/2 juice to about 2 cups of kefir. Love, love, LOVE kefir! I always have a quart culturing on the counter and drink it daily. Actually, I’m making some kefir cheese at the moment with some over-cultured kefir. Love that I can be lazy with it too and it doesn’t ruin, lol! I have a question, I’ve never made kefir or yogurt for that matter, but I was wondering if instead of using cow milk, could I use almond/soy milk and get the same results? Yes, you can use non mammal milks like cow, soy, almond, etc. You will need to use the grains in regular dairy milk (cow’s, goat’s, etc) every couple of batches to keep your grains alive and growing. How many servings does the smoothie recipe make? A poucos dias ganhei um bocado de Kefir de Leite … menos de uma colher de sopa , lavei-os e cobrir com leite num vidro com tampa , mas não acontece nada o leite continua igual 🙁 … noto que os grãos estão um pouco maiores mas o leite não fermenta … o que devo fazer ? If you make too much Kefir do you store the leftovers in the fridge? Bekah, yes, that’s exactly what I do. I’ll keep in the fridge and since it’s fermented, it lasts a long time. I give my extra kefir grains to my dogs for some added probiotics. It is about year I am making Kafir. I use organic full fat milk . Recently been told by GP i have a high blood pressure can i use low fat milk ? Pari, I’m not sure how well the kefir grains (cultures) will thrive on low fat milk. I am in the early stages of kefir making (started early September 2015). My little amount of live kefir grains started out as being about the diameter of a plum and have now grown into the diameter of a softball. Here’s my problem: I am terminally ill and disabled (in a wheelchair). I spent the last week and a half confined to bed with all of my kefir grains in a little over two cups of goats milk, in a glass mason jar, covered with a cloth, a screw-on lid over it and sitting on the kitchen counter untouched. I got out of bed today but exhaustion took me back to bed a couple of hours later. I’m hoping tomorrow will be better and I’ll be able to do a bit more…like separating the grains from the liquid and putting them back in a clean jar with fresh cow’s milk (store bought, vitamin D whole milk). My question is: will my grains be okay to continue using? Will the liquid I get 24 hours later still be okay to consume? Also, I’ve had a jar of tightly sealed kefir liquid sitting in the back of the fridge for about a month and a half. Is it still okay to consume? How long is the liquid stay good for? I know this post is late in this post but I hope someone can help me. Thank you. Nancy, I’m not sure. All you can do is put the grains, about 1 heaping tablespoon, into a glass jar and try all over again. The liquid kefir should last a good while in the fridge as it is fermented. It’ll sour but give it a smell and if it doesn’t smell rotten, give it a taste. If you feel iffy, toss it! One more question: how much kefir liquid is safe to consume per day? I’ve only been putting 1/4 to 1/2 cup of kefir liquid into (about) 1 & 1/2 cups of Greek yogurt and adding 2 tbls. of RAW honey, 1 teas. Madagascar Bourbon vanilla and whatever dark mixed berries that I have on hand. I really want to consume more due to the constipation issues I have from taking 8 to 10 prescriptions 4 x/day plus 2 high doses of pain medications a day. But being disabled with no feeling from my lower rib age to my feet, I don’t want to be stuck in the bathroom all day either. Lol I just wondered how much you can drink per day? I’m really hoping the kefir liquid will help me to become regular every day. That’s my last question. I promise! Grammie, it’s going to be hard to treat your constipation when your on so many meds. Kefir is great but I’m not sure it’ll have enough pro-biotics to keep you going when your battling medication. I would see if you could speak to a naturapathic doctor or chiropractor and see what they recommend. I’m thinking a high dose probiotic pill may be a better route for you! I just wanted to say that I’ve been drinking 2 cups of kefir a day (sometimes blended in a smoothie, sometimes plain) and it has helped me immensely with reducing constipation. The magnesium content of the kefir helps with that, but it’s also the intense probiotics! They help immensely with digestion! Kefir made from kefir grains has over 50 strains of probiotics! I’ve never heard of a probiotic pill that can compete with that! Plus, the probiotics in kefir are right turning bacteria which means they are much, much stronger than the left turning bacteria/probiotics in yogurt. The bacteria in kefir is strong enough to make it past your stomach acids and actually establish whole colonies of good bacteria. Not all probiotic pills can even make it past your stomach acids, plus they’re very expensive. But since the probiotics in kefir are so strong, it’s a good idea to increase your intake slowly. If you increase it too quickly you can have an uncomfortable healing crisis with diarhea, etc. (I know from experience!). But don’t give up on it! If you increase the amount slowly you probably won’t notice any symptoms at all. Check out http://www.culturedfoodlife.com for tons of expert tips on kefir! She has tons of posts to help you tell if your kefir grains are still healthy, troubleshooting tips, etc. 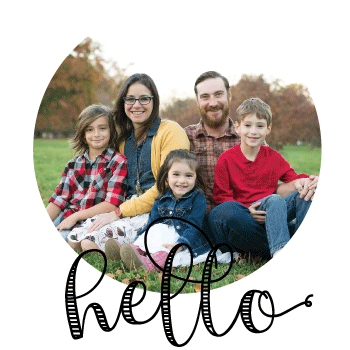 Her book and her blog taught me everything I know about kefir. Good luck! P.S. Check out this link for a list of all the probiotics in kefir!! I’ve taken expensive probiotics in pill form that only had 10 strands and never noticed much of a difference in health. But after drinking kefir everyday, you can’t not notice a difference! Do you have recipe for Kefir yogurt? Christina, Kefir is a type of yogurt. You wouldn’t use it to make yogurt since it’s already cultured. Thank you for all your info to start. My husband has been making this Kefir for me for about a month in half to help me with my stomach issues. But I have not seen any help from it. I’ve had and intestinal resection do to diverticulitis. The problem is I have no more pain but the still have the same symptoms just like having crons or IBS. Been tested and negative. I would hate to disappoint him with all he’s been doing. Should I give it more time? Desperate wife mother grandmother. Jo, it’s going to take time to heal your gut. Have you looked into the GAPS diet? I’m not a doctor or trained medical advisor, but I would give that diet a look and see if seems like something you could try. The fermented products are great in getting that healthy live bacteria into your gut lining, but if you’re having problems due to diverticulitis, you’ll want to think about healing on a deeper level, if that makes sense. In other words, eating an optimal diet with supplementation. I hope that can give you a direction in where to start. Also, if you can find an integrative, functional, or holistic doctor in your area, I would highly recommend visiting them. Blessings! So very close to how I make my kefir smoothie right now. I noticed the 1/4 cup of coconut oil. I use a very generous tablespoon and was debating a bit more. I also use two raw eggs but see you only used the yolk, just a preference? I started using organic bananas and use the whole banana peel and all minus the ends. I often wondered what orange would taste like, now I may have to try it. Thank you. Be well. Thank you for sharing this guide on how to make milk kefir! I definitely want to be able to do this at home whenever I need some probiotics available. I’ve been wanting to make some water kefir for a while but I just didn’t have the grains available – I want to make my own! Thanks again for sharing. Where can I get the Kefir grain? You can order grains at cultureforhealth.com.